Since I’m not a scientist or doctor – you can read that abstract or google your little heart out to find out why they are so bad. So what’s our option to those toxic sheets of anti-static magic? One word: vinegar. Vinegar is a natural deodorizer and cleaner, and amazingly, it prevents static. Did I mention cheap? Okay – it’s cheap, too. How do I use it? 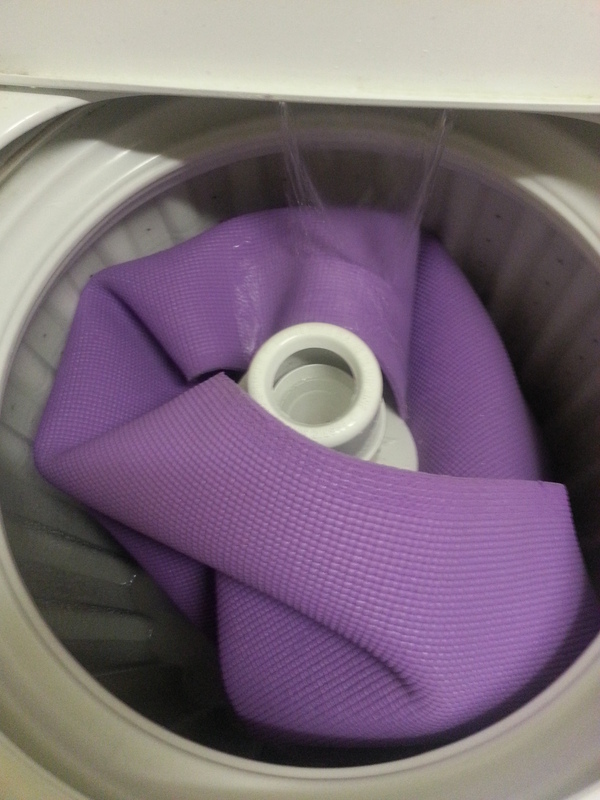 Add about a half of a cup to the rinse cycle, an old downy ball, or the fabric softener cup inside your machine. 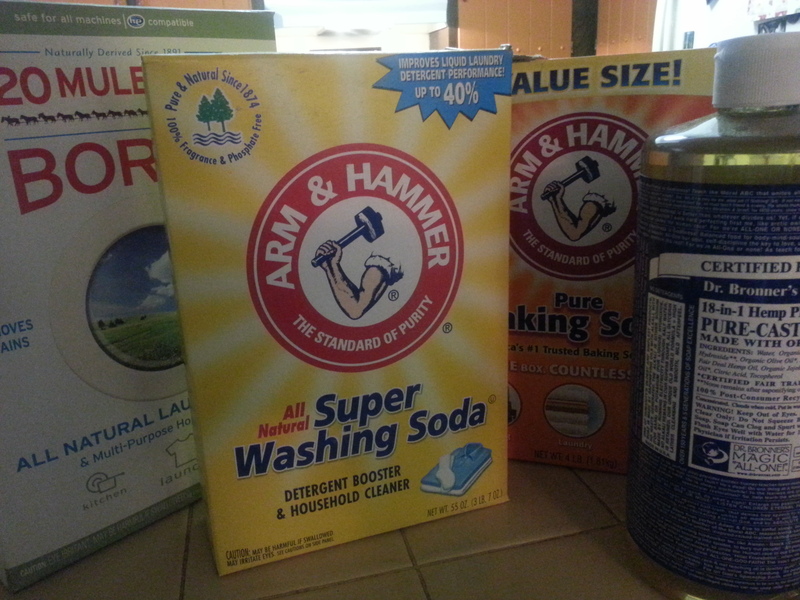 I found a lot of great information about natural fabric softeners on DIY Natural’s website. They have great tips on how to use essential oils to help boost your laundry, too. New twist! Whitening fabric softener!!! As many of you may know – lemons have natural lightening properties. Lemon essentials oils are used as a natural bleach. Since I already had some lemon rinds steeping in some vinegar, I decided to see how well it worked on a dirty cream-colored jacket that needed a good washing. 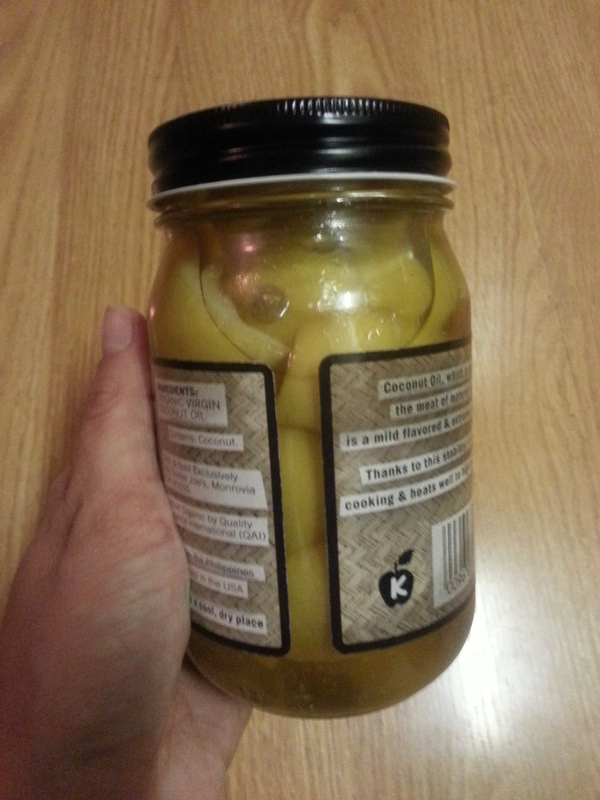 I simply strained the lemon rinds which had been soaking for about 2 weeks in the jar of vinegar, and put the resulting liquid into an old bottle, and then filled it the rest of the way with fresh white vinegar. 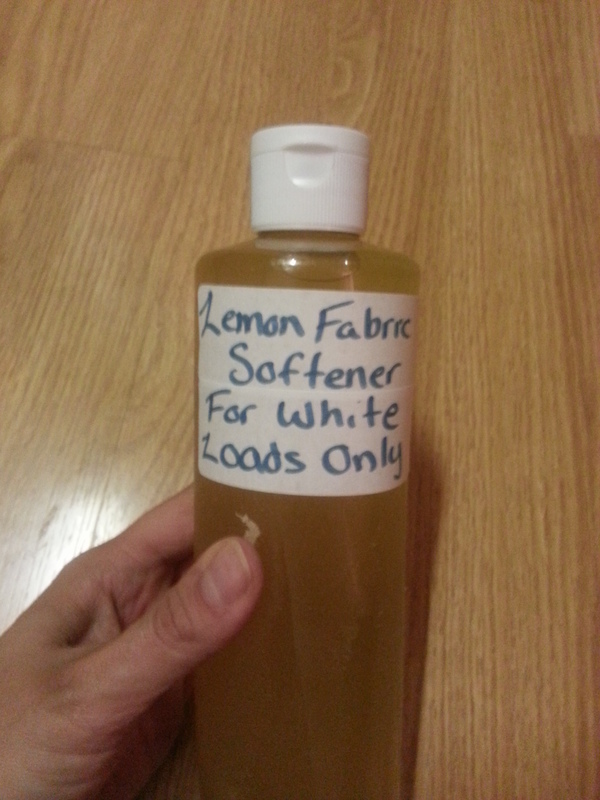 I labeled it so no one uses this on colored clothes, since it has the potential to ruin/bleach them. 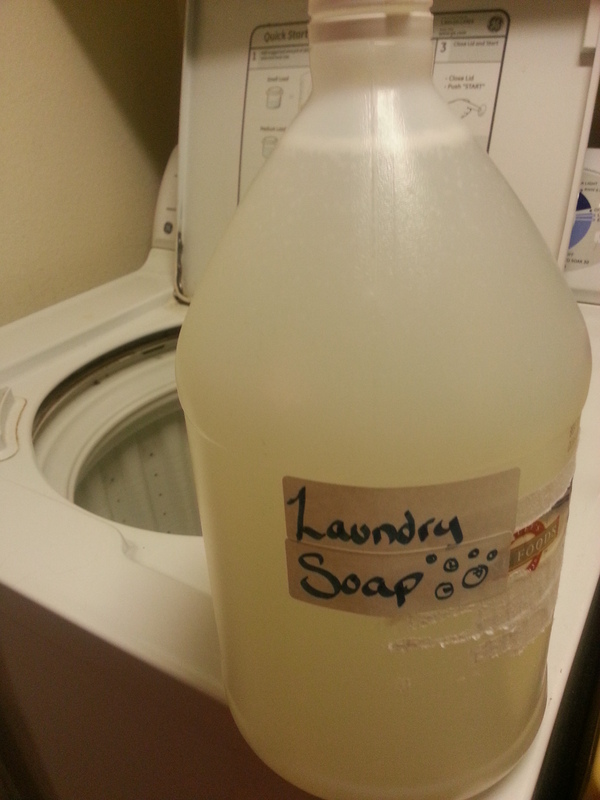 I used a 1/4 c. of my natural laundry soap and about 1/4 c. of the lemon fabric softener for a small load. The results? Awesome! The jacket that had black and brown smudges on it was clean and cream once again. The smell? Naturally clean. I promise you, your clothes will not smell like vinegar. Give it a try! You might be amazed with the results, and all the money you have saved. Let me know what you think in the comments section. How else do you use vinegar? I know I use it for just about everything! 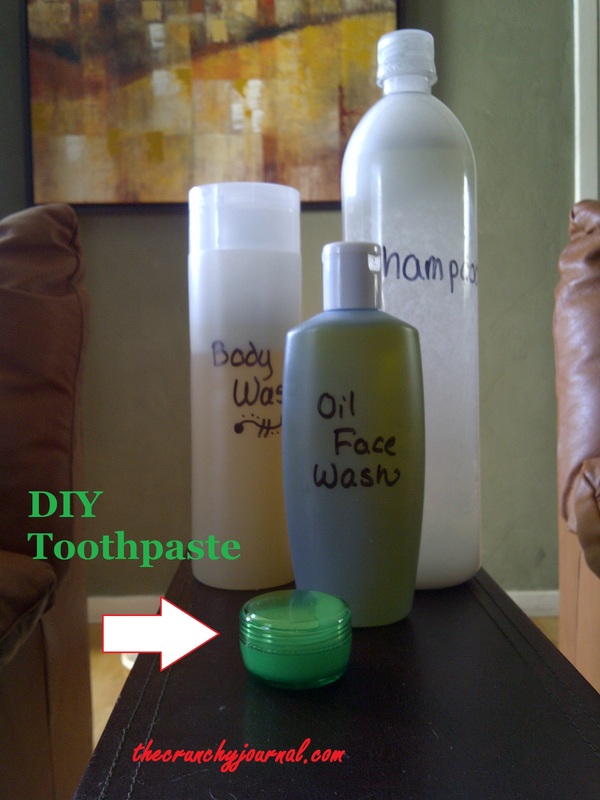 I read a great line on DIY Natural’s blog the other day:”If they sell it in the store, you can make it at home.” This is SO true. In my quest to go all-natural, one of the easiest things to get rid of is that toxic crap they call laundry soap. It’s bad for you, it ruins your clothes, and destroys the environment. To add insult to injury, they charge ridiculous prices for it! The grated bits of soap don’t always dissolve, so sometimes, I will find little chunks of soap on clothes. I try to remedy this by putting the washer on a 15-30 minute soak cycle. I allow the basin to fill with water, add the soap (while it is filling), and once it is filled, I add my clothes. This extra time allows the soap an oppotunity to dissolve. Use a funnel to put the borax, washing soda, and baking soda in the jug. Fill the jug 1/3 of the way with hot (not boiling) water. Put the cap on and shake to dissolve the borax and sodas. Now add the peppermint soap, and fill the rest of the way with cool water. Give it a shake, and it’s ready to go! I like my new recipe much better. It is less work than the first one (grating soap can be tiring), no soap chunks, and it seems to clean better! I do use more of this, about 1/2 c. since it is a diluted mixture. Our clothes are always clean and fresh. Since there are no harsh chemicals, our clothes last longer and don’t fade. Win Win!